RSS is a family of web feed formats, specified in XML and used for Web syndication. GeoRSS is a way to encode location in an RSS feed. The GeoNames "RSS to GeoRSS Converter" reads the entries of an RSS feed and searches the GeoNames Database to find a location for the entry text. If a relevant location is found, its latitude and longitude are added to the RSS feed using the GeoRSS encoding. With the converter you can for example view the Reuters World News on a Map. The converter is a 'natural language processor' and needs to take into account in which language a text is written. Supported languages are English, German, Spanish, French and Italian. See also the GeoNames Blog for details about the rss to GeoRSS converter. GeoRSS does not yet support other geographical information other than latitude and longitude. The geonames.org team is proposing to add more geographical element to the GeoRSS standard like country code or place name. As soon as GeoRSS includes this information it will be added to the converter. The draft for the new elements is here. Result » returns a RSS feed with latitude and longitude for each entry where the geonames search engine has found a relevant location. Already existant GeoRSS elements in the feed remain unchanged. There is an upper limit of 20 entries for performance reasons. feedUrl string (required) The url of the RSS feed to search locations for and to convert to GeoRSS. The feed has to be syntactically correct, i.e. wellformed xml and valid rss/atom. Note : the feed url needs to be 'url encoded'. feedLanguage string (optional) en,de,fr,it,es The language of the feed, this information is needed by the geonames search engine to find relevant locations. Default : No value = automatic language detection. kml The output RSS dialect of the conversion. Default : same RSS dialect as input feed. With type=kml the output will be in GoogleEarth kml format. geoRSS string simple,gml,w3cGeo (optional) The GeoRSS output encoding used for lat/lng. See www.georss.org for details. Default is w3cGeo. addUngeocodedItems true Items that could not be geocoded are removed from the response document. Setting the parameter addUngeocodedItems=true will include the ungeocoded items in the response. country string (optional) two-letter iso country code Restrict geocoding to a given country. This parameter may improve the results of the geocoder for feeds focusing on a single country. The first GeoRSS reader we know about was the ACME GeoRSS Map Viewer. With the form below you can convert a RSS feed into GeoRSS and view the result on the ACME GeoRSS Map Viewer. With the parameter "type=kml" the RSS feed will be converted in GoogleEarth KML format. With the form below you can convert a RSS feed into KML and view it with GoogleEarth. Note : KML files can also be viewed on google maps. Here the recent earthquakes RSS feed from the USGS converted with geonames and displayed on google maps. If you want to use an other viewer you have to 'url encode' the address of your feed before feeding it as a parameter to the rrs to GeoRSS converter. In the forms above for the Acme viewer and GoogleEarth this step is already included. Chapter 10 in 'The Geospatial Web' describes the GeoNames RSS to GeoRSS converter. 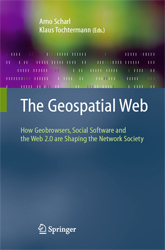 The 25 chapters contained in this edited volume summarize the latest research on the Geospatial Web's technical foundations, describe information services and collaborative tools built on top of geobrowsers and investigate the environmental, social and economic impacts of knowledge-intensive applications. Several chapters focus on the integration of geospatial and semantic technology to extract geospatial context from unstructured textual resources; e.g., to automatically identify and map the most relevant content for customized news services. Hybrid models combine such automated services with the advantages of individual and collaborative content production environments. for example by integrating "edited" material from newspapers and traditional encyclopedias with "evolving" content from collaborative Wiki applications.